Starring Charles Boyer, Joan Fontaine, Alexis Smith, Brenda Marshall, Charles Coburn, Dame May Whitty, Peter Lorre, Joyce Reynolds, Jean Muir, Montagu Love, Eduardo Ciannelli, Marcel Dalio. Written by Kathryn Scola from the play by Basil Dean & Margaret Kennedy and the Margaret Kennedy novel. Be forewarned, this is a review of a classic "women's picture". When a lost or suppressed movie is revived, it is best not to get one's hopes up. Even after waiting a lifetime to see what was previously forbidden, many shows turn out to be disappointments. With the one caveat that it is an unashamed "women's weepie", The Constant Nymph is a knockout on all levels. The reasonably intelligent story plays as if it were the work of a fictitious extra Bronte sister, one born a century too soon to write glorious ill-fated romances for the movie screen. There's the innocent, impoverished, altruistically noble composer, a fellow who can achieve greatness if only he finds the right female muse. There's the unofficial duel for his affection between the sophisticated socialite, and the simple mountain girl whose love is both pure and boundless. There's intrigue, tragedy, and unfulfilled desires galore. If that sounds awful, believe me, it works. The Constant Nymph is packed with good performances and graced with what may be the great composer Erich Wolfgang Korngold's most effective operatic romance score. The Constant Nymph has been out of circulation for half a century. For followers of great movie music, its return is big, big news. Don't be dismayed by the outlines of this plot. It seems to take place in the 20th century during peacetime. An idyllic European mountain is home for the musical Sanger family, led by the noble paterfamilias Albert (Montague Love) and given spirit by his unspoiled, spirited daughters Kate, Paula, Toni and Tessa (Jean Muir, Joyce Reynolds, Brenda Marshall & Joan Fontaine). The older Toni is pursued by the somewhat oily but sincere Fritz Bercovy (Peter Lorre), The naïve and hopelessly romantic Tessa moons after the penniless Lewis Dodd (Charles Boyer), one of Albert's disciple-composers and a frequent guest at the chalet. But the dreams of the physically frail teenager are shattered when her father dies and English relatives come to settle the family affairs. The moody Lewis chooses the established, high-toned Florence Creighton (Alexis Smith) for his bride. Florence means well, but she encourages Lewis to fit his music into an acceptable, established mode, which soon makes him unhappy. Florence doesn't mind when Lewis asks that the Sanger girls be brought to England for a proper education and finishing, but must restrain her rage when young Tessa influences her husband's heart as well as his work. As Lewis prepares a mighty concerto for his grand London debut, Florence feels certain that she's lost him to the young interloper. Here's the lowdown on the film's star fireworks. Top-billed Charles Boyer is his usual suave self, working hard to stay interesting as a standard tragic romance hero, the kind that either doesn't recognize his own feelings or doesn't communicate them. Considering that Lewis Dodd comes off as a positive character, the role is quite an accomplishment. Not being a goofy fan of two-handkerchief sagas, drippy composer Dodd taxes my patience. But his kind of character is essential to this brand of movie. Joan Fontaine! I have to admit that until now I've only really cottoned to Ms. Fontaine in Ophuls' Letter From and Unknown Woman, still the classic picture that best transcends this genre.Jane Eyre is certainly a good shot, but I haven't seen too many more of Fontaine's pictures. Her charms in the Selznick-Hitchcock pictures (Rebecca, Suspicion) have eluded me. 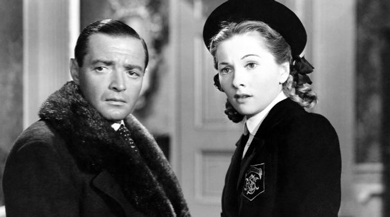 And Ms. Fontaine has forever been branded as the Evil Sister in her lifelong feud with Olivia de Havilland, a great actress who I suspect is equally capable of twisting the knife in an old grudge. Fontaine's Tessa in The Constant Nymph may be the best example of a particular weepie cliché, the winsome, forthright child-woman, the one that either gets trampled on or lands the big-name male star in a final embrace. If Tessa weren't truly innocent she could be really annoying, as she inadvertently drives a fat wedge between Lewis Dodd and his helpless, clueless bride. Few actresses can make this specialized material work. At age 25 or 26 Fontaine is a wholly convincing 14 year-old. It is said to be her favorite film. Seeing this show's supporting cast is like meeting old friends under new circumstances. 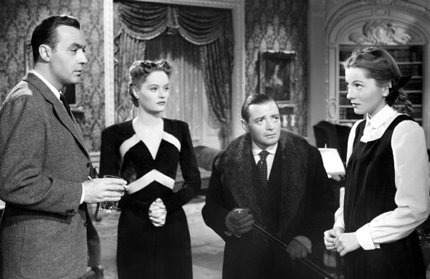 Peter Lorre hasn't a particularly important part yet it's a big treat just to see him in something new. Brenda Marshall is amusing, Charles Coburn serviceable and Dame May Whitty shows up to add a little extra class to the London segment. The Constant Nymph is also a great picture for Alexis Smith, who is frequently dismissed as a stiff and incommunicative ice queen. 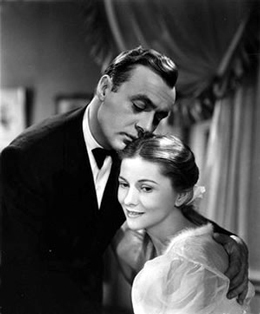 Already having proven herself adept with slick dialogue in Gentleman Jim, Smith does fine work in the Thankless Role of the competitor for the romantic hero. Florence has the wedding ring yet is willing to step aside, a fairly fresh plot twist as these movies go. Other aspects of the story are more predictable. Nymph conforms to the formula that Great Talent needs Great Romantic Inspiration, which is why Lewis Dodd is so mopey when under the influence of the conventional Florence. Offhand I'd guess that real great music is great because great composers live in a state of perpetual inspiration and experimentation. I imagine that a productive composer gathers musical thoughts in his head the way the rest of us gather wool. Director Edmund Goulding directed several of the better Bette Davis weepies and keeps The Constant Nymph on track throughout. He's particularly good working on interior/exterior sets, as when Lewis and Tessa climb a particular hill, the 'significant romantic spot' favored in these shows. The camera cranes up and around to follow them. In keeping with the delirium of the concluding concerto -- some of which is Tessa's actual delirium -- Goulding employs strange ethereal effects of the kind seen in Henry Hathaway's fantastic, surreal Peter Ibbetson. The notion is that a great love or great art can transcend reality. In practice, the effect often worked only with the help of audiences particularly attuned to the aura of a star or the grand, cosmic predicament concocted by the scenarist. In Nymph, Tessa and Lewis return to that lover's hill for one last time, to connect on a spiritual plane. The operatic abandon of this sequence is similar to the grandiose death scene at the end of the Joan Crawford movie Humoresque. I can just see Goulding, producer Henry Blanke and everyone concerned with the show thinking, "This'll really get 'em, there won't be a dry eye in the house." That isn't my exact reaction, but it's impossible not to appreciate the skill and artistry of everyone involved. I hope that the deliriously romantic The Constant Nymph connects with a wider audience than only already-interested fans like myself. 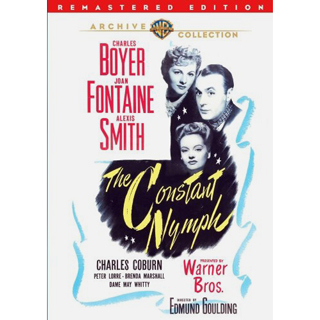 The Warner Archive Collection DVD-R of The Constant Nymph is a Remastered Edition that has an unsteady shot or two and its share of minor scratches but otherwise is in excellent condition. Being locked away in a vault for 50 years, unable to be screened commercially, surely helped keep it from being over-printed. The transfer gives full justice to Tony Gaudio's radiant images. The presentation includes a trailer that begins with director Goulding on a sound stage. He practically charges the camera to endorse his new film as an extra-special attraction. Korngold's music features strongly in the trailer, which also treats Alexis Smith as a new discovery, although she had been in Warner pictures going on three years. A silent English version starring Ivor Novello and Mabel Poulton was named the best British feature film of 1928. In it Lewis Dodd and Tessa run away to the Continent; otherwise the silent film's plotline seems very similar. 1. Perhaps the best example of this is the Technicolor MGM musical Annie Get Your Gun. It got yanked from TV screens sometime in the '60s or '70s and didn't return until the year 2000. I remember reading many letters to MGM from fans distraught that they could not see their favorite move. When the finally show reappeared many of them were gone. Younger audiences required some context to appreciate the great star Betty Hutton. 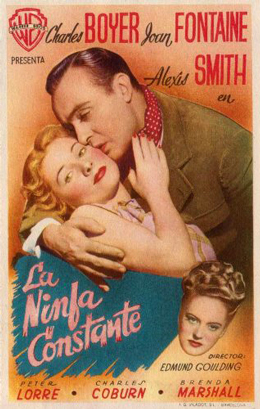 The Constant Nymph is even more of an unknown quantity to today's general audiences, even though it was greeted by excited crowds at the 2011 TCMfest. 2. I assume that many film-fan movie music lovers have heard the Constant Nymph mini-concerto in the Charles Gerhardt / National Philharmonic Orchestra recording from 1972. That's where I got my first charge of Erich Wolfgang Korngold, and began keeping an ear cocked for EWK movies. But the movie for the album's most delirious cue, The Constant Nymph, never surfaced, and I didn't know why. 3. I'd have to say that WB insiders probably had access to it, if they were interested. And it's entirely likely that the film may have been brought out for non-commercial museum screenings from time to time. So if you DID see The Constant Nymph in the 60s, 70s, 80s or 90s, please don't call me a liar!